This leather football features one patch of brown leather with Wilson and NCAA written on it. The remainder of the football contains white leather featuring blue signatures and "Wilson" in black lettering. 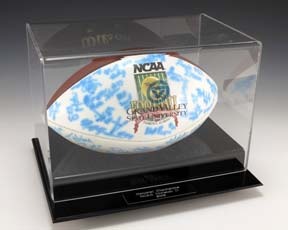 It also contains the NCAA 2002 Division II Championship logo. The football sits within a clear covering with the GVSU logo on the front and a black base that contains a plaque.